Hi all. I was trying to search this forum for this problem of mine, but I can't find it anywhere, so I'll post about it here. 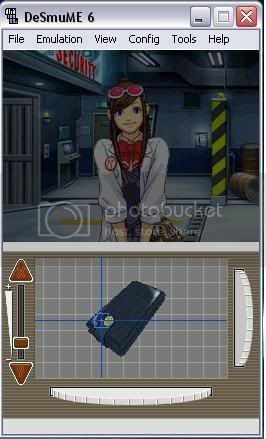 The game runs very smoothly, except when I get to the fifth case, where you had to examine a wallet for evidence. Apparently no matter what you do when you examine the wallet, nothing happens. I tried flipping the wallet in all sorts of angles and pointing everywhere at the wallet, but nothing seems to be happening. I'm just guessing that there might be missing buttons or something, but I'm not totally sure. By the way, I'm using 0127 - Phoenix Wright - Ace Attorney [0, US] if that is any help. err.... How can i send it? I have a save state of that. It doesn't work for the simple reason of time and "pen" hold issues. It works great in the DS(I have examined the process and it seems that you need to hold your pen on the golden thingie for a couple of seconds, 10 seconds in DeSmuME) so when optimizations are complete it will work smoothly. If you are reading this signature, you SERIOUSLY need to get a life. Okay... I didn't buy mine in the US though... UK. I have a bit of a problem getting to the savegame after the first examination, as I have progressed alot in the PC without noticing bugs and my save state is put too late to be able to save the game and actually flash that into the EEPROM (the real hardware) of the game. Ouch, doesn't work with my dump I guess I'll just get a savestate from gamefaqs and play the fifth case until the bug. Here, sorry about the very late late posting, Megaupload was not very cooperative with me. If it helps, when i checked the walkthrough for this game, it said that you were supposed to look at the side and then the girl Ema would notice a clue, but when I played it nothing happened, even if I rotated the whole thing everywhere. I've tried that too... I've done several reenactments of things both on the real hardware and DeSmuME... Nothing. What the DS uses to check if you're pointing to a specific point, isn't implemented. I started an implementation yesterday, but it'll take a bit to get it right and working. Oh... I thought that the Phoenix Wright team were smart enough to come up with their own software-based raytracing... Damn.. Didn't think it was hardware issues. Is the fix in the CVS? No, and stop asking when new features will be on cvs. When its there youll know. Hoping for a solution to fix the problem. No solution on current CVS, neither know if the commit will be fixed in the future: at the current moment you've to consider that part a compatibility problem, only avoidable using a save game/save state of later in the game. Aww! too bad. anyway just as soyuchi said can anyone post a save state after opening the wallet. Hoping someone can post a savefile or state. So we can progress with the story. Stop bumping an old topic. I have a savegame of the finished game from my card so I can't help you, plus, most of the chapter involves this 3D searching so it's pointless trying to play it. In another topic, microphone is not implemented as well so no blowing on fingerprint powder as well... Give up.